Thank you for your part in making the American guarantee of trial by jury a reality. The Ohio Constitution guarantees each citizen a right to trial by jury in both criminal and many civil matters. This website is designed for jurors, employers and the public to find information about Ohio’s jury system. Jurors are selected at random by computer, from the voter registration list. A juror must be a United States Citizen, a resident of Butler County, and at least 18 years of age. Few activities in our civic life provide such a direct contact with our democracy as does jury service. Besides voting, nothing is so active and participatory in nature. In fact, Thomas Jefferson believed that serving on a jury is more important than voting. He said, "I consider trial by jury as the only anchor yet imagined by man by whom a government can be held to the principles of its constitution." 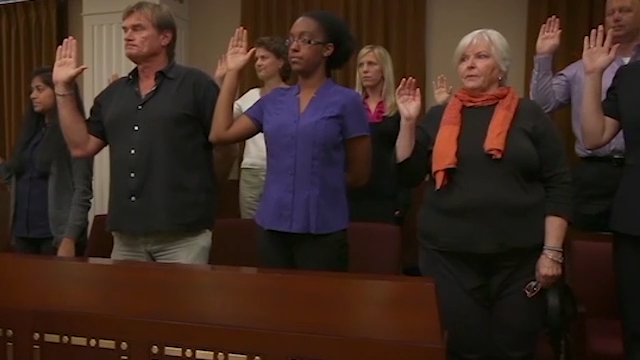 The jury system depends on your service as a juror. You do not need special skills or legal knowledge. You do need an open mind and the ability to make decisions free of bias. As a juror, you will listen to opening statements, learn about the evidence collected for the trial, hear instructions regarding the law to follow in rendering your decision, and hear closing arguments. Finally, you will talk it over with the other jurors during deliberations and make a decision about the case. During the trial, the judge serves as the court's presiding officer and as the final authority on the law. The lawyers act as advocates for their sides of the case. As a juror, you are responsible for impartially evaluating the evidence presented and determining the facts under the law as the judge instructs you. These combined efforts make America's system of justice the best in the world. Jury Service Benefits You, Too! It is an honor to serve as a juror. As a juror, you will gain first-hand knowledge of the workings of the judicial branch of government and preserve your own right to a jury trial. Yet jury service may also mean rearranging schedules, canceling appointments, and oftentimes missing work. We appreciate the sacrifices necessary to be a part of a jury. Our staff is committed to making your jury experience a positive one. This website is intended to answer many of your questions without the need for a phone call or email. However, if you have additional questions or concerns, please do not hesitate to contact The Court Administration Office by phone at 513-785-6550 Court Administration.